The kids in Room 132 do not seem to care about miss­ing out on the usu­al “Fun Day” menu choic­es of extra free time, videos, or games. They are excit­ed about our spe­cial day of lit­er­a­cy-based activ­i­ties. The sign-up list for book talk­ers is grow­ing… the max­i­mum of 10 is quick­ly reached. The titles being pro­mot­ed come from a vari­ety of sources; the pub­lic library, our school or class­room library, per­son­al col­lec­tions from home (which change fre­quent­ly, thanks to our week­ly book swap­ping) or even from our very own “class­room author col­lec­tion”. 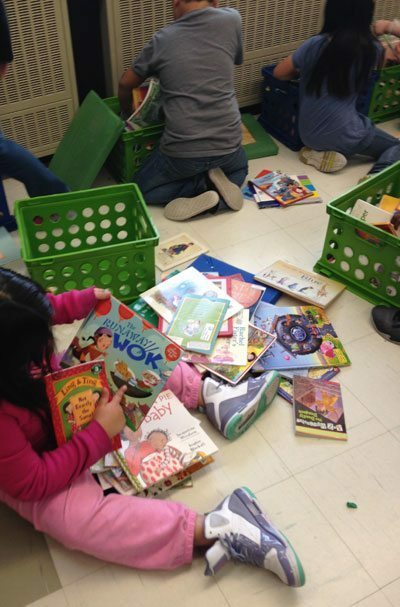 Once the book talk­ers wrap up, the book crates that store our mas­sive col­lec­tion of class­room books are uncov­ered. 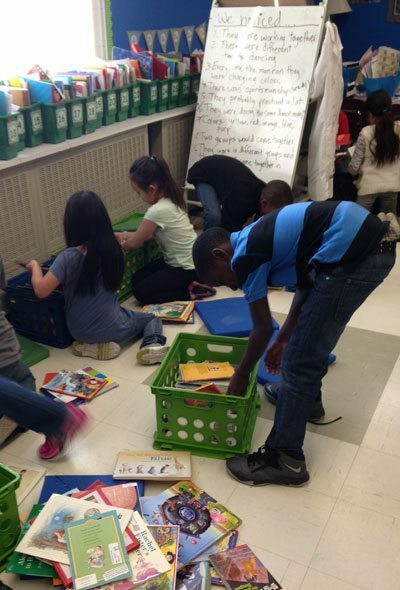 Eager shop­pers are ready to select new titles for their per­son­al book box­es, which are stored on the counter that runs the length of our class­room. Each plas­tic bin holds from 4–15 books, depend­ing on the genre and thick­ness. These books are select­ed almost entire­ly by stu­dents. Although we all under­stand what it means to have books that are “just right”, occa­sion­al­ly stu­dents need to reflect on their book choic­es. How­ev­er, I don’t insist that kids pick books that are only from a spe­cif­ic Lex­ile or guid­ed lev­el. The main cri­te­ria is that kids choose books they want to read. I often won­der how this could be con­sid­ered a “nov­el” idea… shouldn’t this be the rule of thumb? under­way. 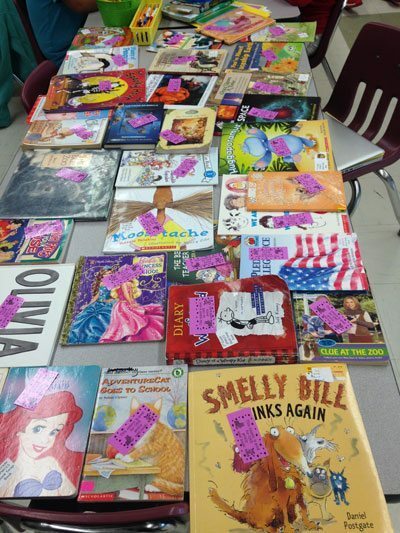 Gen­tly used books that were turned into the book swap box in the morn­ing are care­ful­ly laid out on a table. Book swap coupons are place on top of each book. Coupons can be used right away or saved for a future swap. In addi­tion to this day’s inven­to­ry, we add many oth­er books from pre­vi­ous Fri­days’ book swaps. Read­ers who are ready to make a trade, col­lect their coupons and begin perus­ing the avail­able titles. Some­times, extra coupons are hand­ed out as rewards. The class­room is trans­formed into a bustling mix of book swap­pers, some choos­ing new “gen­tly used” books for them­selves while oth­ers are look­ing for a book to give to a younger sis­ter or broth­er. Unlike books that are cho­sen dur­ing “book shop­ping”, book swap books are tak­en home “for keeps” or per­haps, brought back to be trad­ed in a future book swap. Coupons and books, ready for swap­ping. As I sit back and watch a love of books and read­ing take over our class­room, a sat­is­fy­ing smile spreads across my face and my heart. This is real­ly what it is all about. Kids who want to share their thoughts and opin­ions about what they are read­ing. This after­noon of pro­mot­ing a love of lit­er­a­cy is not out­lined on any dis­trict cur­ricu­lum plan, it is not found on the pages of any teacher guide, and it most cer­tain­ly won’t be the focus of any ques­tions on the man­dat­ed stan­dard­ized tests com­ing next month. 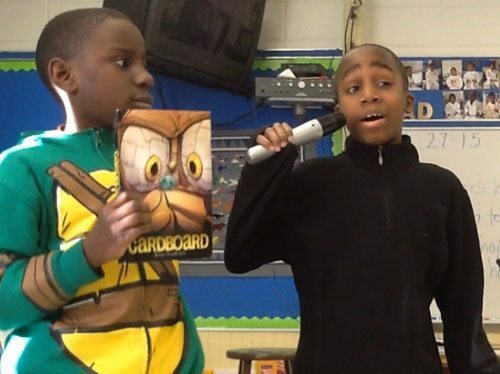 How­ev­er, I will wager a bet that years from now when these amaz­ing 8- and 9-year-olds think back to third grade, they will fond­ly recall “Book Talk, Book Shop, and Book Swap” and the fun we had on Fri­days in Room 132! I want to be in your class! Won­der­ful post. Thanks for nur­tur­ing life­long read­ers. Thank you, Tri­cia! You are wel­come to vis­it us any­time! Mau­r­na, you are a true gem! You so care­ful­ly and cre­ative­ly find ways to inter­twine what’s real­ly impor­tant in a school day and I’m so thank­ful to know your pas­sion!!! Hap­py Wed…only 2 more days until BS, BT, and BS! Thank you, dear Kris­ten! We share that pas­sion and I am lucky to call you friend!! Hap­py rest of the week to you!